The transiting Sun gave more life-force to the day and the journey due to the influence of the south nodes of Uranus and Venus. Mercury square Neptune allowed for a letting go; it is a dissolving or relinquishing influence. Pallas Athene in opposition to Chiron is suggestive of a sense of the coming together of a right moment, of a merging into one, a rebirth to a higher plane of consciousness. Jupiter trine Saturn also allows for actualization to occcur. 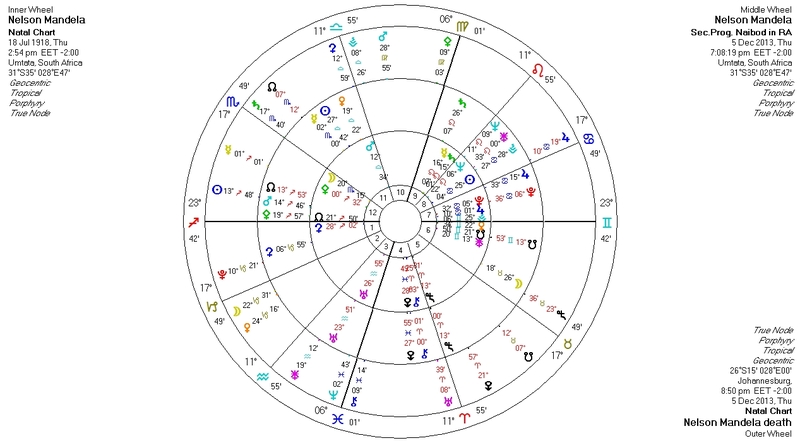 Transiting Sun (13 Sag) in the 12th house conjunct progressed Mars (14 Sag). Quick Thoughts on the astrology of the transition chart: The transiting Sun conjunct progressed Mars and also the south nodes of Uranus and Venus created enough energy or momentum for the transition to occur. Venus and Jupiter will often show up in a death chart. Venus and the second house correlates specifically to survival. Mortality is a Capricorn archetype. Venus was currently transiting Capricorn and opposing the natal Sun which is situated in the 8th house – a death signature. 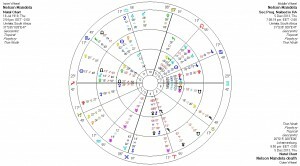 The transit of Venus is also the ruler of the transiting south node in Taurus. The south node of Taurus was transiting the 5th house – a vitality or life force house. The karmic axis (the north and south nodes) in square to Neptune in the 8th house. Neptune is the planet that correlates to source – is suggestive of the soul choosing this karmically destined moment for transition. The transit of Mars opposition to Eris in Pisces is suggestive of the building and overtaking desire to transcend -to leave the body and to merge into oneness with source (Pisces) – the motivating force to leave the body and to return “home” (4th house).